Since the Bush Administration passed the Unlawful Internet Gambling Enforcement Act (“UIGEA”) back in late 2006, the task of finding a decent online casino has been significantly more difficult for US players. Almost every major European Union licensed operator withdrew from the American market, leaving a rag tag bunch of smaller, opportunistic casinos for US players to choose from. To be fair, some of these ‘smaller, rag tag’ casinos aren’t that small. Some are among the industry’s pioneers, operating without incident since the late 1990′s (eg English Harbour). But the fact remains, when it comes to choosing an online casino, US players face a far more limited selection as regards both quantity and quality than players from most of the rest of the world. And while choice is limited where online casinos generally are concerned, turning to live dealer casinos, that choice narrows to practically non-existent. An unfortunate reality for US players is that most casinos that live dealer games happen to be amongst the larger, European licensed brands that withdrew from the US market back in 2006. Both Microgaming and Playtech, the industry’s 2 largest software developers who are leading the charge into live dealer platform development do not allow their licensee casinos to accept US players. And the likes of William Hill, Ladbrokes, Bwin, bet365, Unibet, PartyGaming, Expekt, 888.com, Blue Square…etc etc – the biggest online gambling names, who have all added live dealers to their product offering in the last couple of years, all do not accept US players. 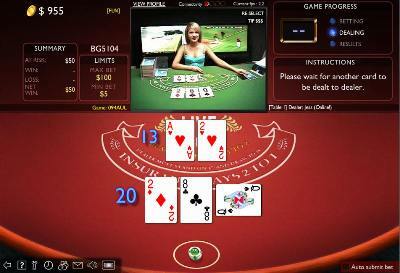 The live casino landscape is a very baron one indeed if you live in the United States. And this will probably remain the case until such time as (if at all) UIGEA is repealed and replaced with a regulatory regime that allows the likes of Harrahs et al to go online. It’s baron but its not totally bare. One casino that has live dealers and will accept US players is Betphoenix. They offer blackjack, baccarat and roulette and accept UseMyWallet (one of the few virtual wallet services available to US players). And the games are very playable. Of course the downside is, they are licensed and based in Costa Rica. Which isn’t to say they are unscrupulous (the word in the forums is they’re trustworthy operators), but it is to say that if they were you would have little recourse if you had some issue with them.